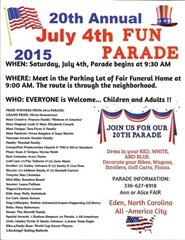 RC Tennis is walking in the 2015 July 4th Fun Parade in Eden. RC Tennis is walking in the 2015 July 4th Fun Parade in Eden. Meet us under our banner in the Fair Funeral Home parking lot for a fun walk through the neighborhood. Wear Red, White and Blue and bring your racket.